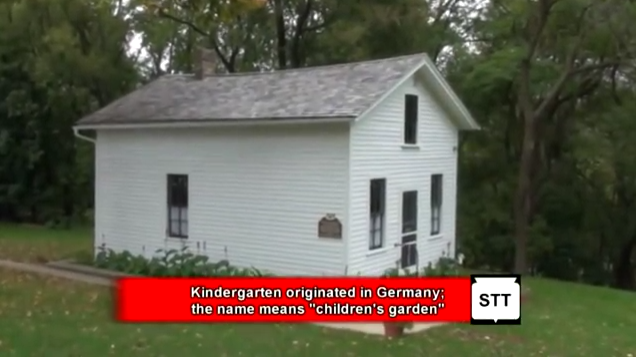 Watertown is officially recognized as the site of America’s first kindergarten. In 1856, Watertown was Wisconsin’s second largest city, sitting at the western end of the famous Watertown Plank Road from Milwaukee. Watertown resident Margarethe Meyer Schurz, wife of the famous German-American statesman Carl Schurz, learned about children’s education in her native Hamburg, Germany. She opened a school known as a “children’s garden” – aka a “kindergarten” – for her kids and some relatives’ kids. When other area kids wanted to enroll, she expanded from their home on Church Street into a building on Second and Jones in downtown Watertown. The Schurz’ left Watertown in 1858 for Milwaukee and eventually Washington DC, where Carl Schurz became minister to Spain and served in other roles in President Abraham Lincoln’s cabinet. He later became editor of the New York Post. The building continued to host kindergarten classes for over four decades before becoming a cigar factory, then a fish store, and then a religious bookstore. In 1956, the building was moved to its current location behind another famous historic landmark, The Octagon House. Both are now operated by the Watertown Historical Society and are open for tours. The interior depicts a day when classes were in session. You’ll find the site of America’s first kindergarten behind the Octagon House on Charles Street. It’s southeast of downtown Watertown, just south of Highway 19, Business Highway 16 and east of Business Highway 26. 2 Responses to "America’s First Kindergarten"
Hello, my name is Gideon. I am a student in Endeavor Charter School. Endeavor is a project based learning environment where students create different projects to earn credit. My project is about America’s First Kindergarten. I was wondering if you could answer a couple of questions for me?